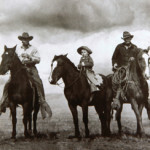 We have been ranching for over 140 years. Today, we are developing practices including grass fed, free ranging cattle that benefit the consumer, environment and livestock. Our small cattle ranching operation provides food for the local market, eliminating wasteful transportation while the cattle consume fresh, pesticide free grasses on the open range. This approach is better for the environment. The typical animal raised on a large processing farm is fed grains and corn that is heavily sprayed with pesticides. These large corn and grain farms are heavily subsidized by the U.S. government. Research shows that the typical animal raised on a large processing farms is trucked 1,500 miles on average to their final destination for processing and consumption. This agricultural model is expensive, wasteful, and creates a large amount of pollution. It is better for our community. Much of the beef industry is controlled by a few, very powerful food companies. Our beef is local beef sold in local markets. Cattle are never held in pens or confined spaces and spend their days roaming the land.